New to ONU or interested in trying a new service? Download our $20 gift and book an appointment today! 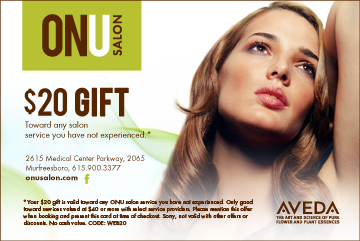 *Your $20 gift is valid toward any ONU salon service you have not experienced. Only good toward services valued at $40 or more with select service providers. Please mention this offer when booking and present this card at time of checkout. Sorry, not valid with other offers or discounts. No cash value. Avenue Mall Employees receive 20% off services and 10% off products. Work nearby? Give us a call to see if you qualify for our neighborhood special! Cultivate reward points with each purchase. Earn points redeemable for special gifts, spa treatments and more with Aveda's Pure Privilege℠ program. Who says there's no such thing as a Free Hair Cut? Pre-book your next 6 hair cuts with us and the 7th one is on the house. Let's fill up that calendar! Birthday Special - Treat Yourself! Receive 25% off all retail products on your birthday. Aveda Pure Privilege℠ members also receive a free Aveda Beautifying Composition™ Oil. Not a Pure Privilege℠ member? Ask the front desk to sign you up! Refer anyone to ONU Salon, you'll receive $25 gift toward Aveda products and your friend receives $20 off their first service. No limit to referrals.